Mr. Sunil P. Joshi has to undergo an urgent liver transplant as his life-saving surgery . 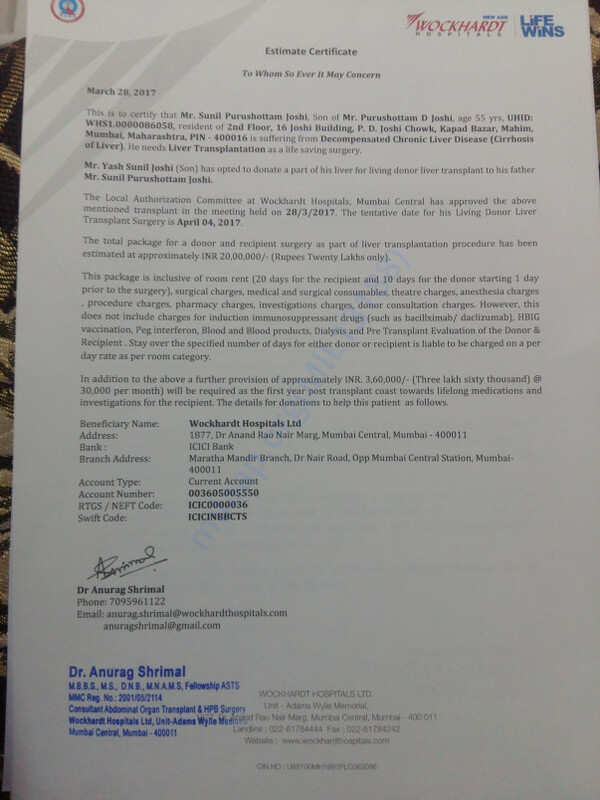 His son Mr. Yash S. Joshi has come forward to donate a part of his liver to his father. 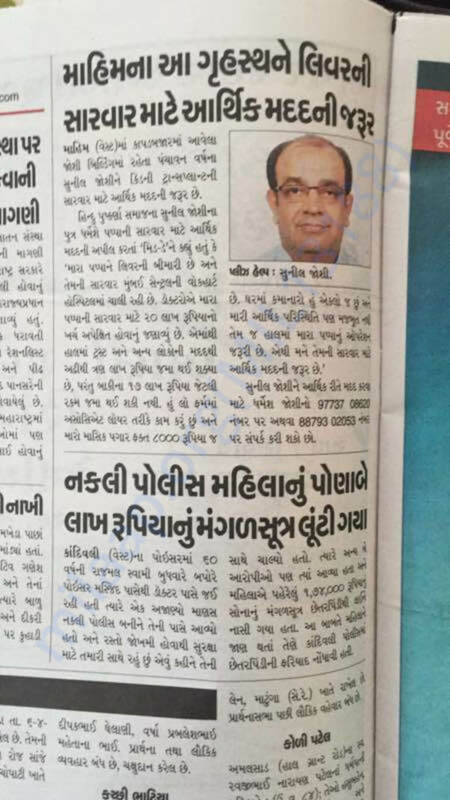 Sunil is suffering for Cryptogenic Cirrhosis of Liver Stage III, his Liver Cirrhosis is not due to any influence of alcohol nor any harmful substance. Over the period of last 1 and half years, his health has been deteriorating. We have admitted him into hospitals at regular intervals. We have almost spend more than Rs. 5 lakh on treatment so far. We have exhausted all our savings now. Post care sirgery cost is also a huge amount.The only cure he has is Liver Transplant. He has been advised urgent Liver Transplant. 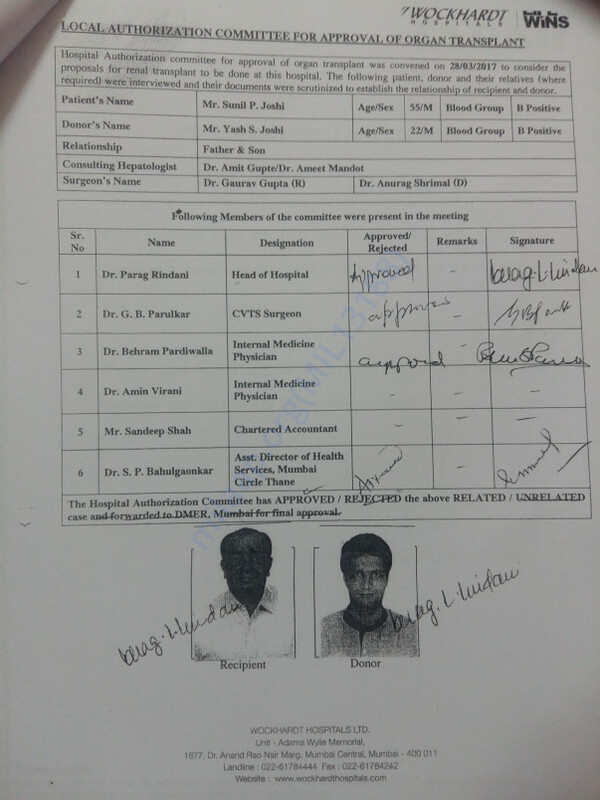 Final approval of transplant committee has also been received. 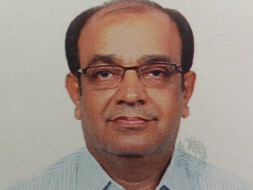 Mr. Sunil P. Joshi has to undergo this crucial surgery within the next few weeks. Surgery will be scheduled by last week of April. Be kind enough to be a part of our campaign so that he can undergo surgery at the earliest. Please help generously as my father needs your blessings and monetary help to fight for life. Help us fight with unexpected medical costs as he has a very long recovery ahead. It is unclear as to when he will be able to resume work. The smallest of donation towards my father's treatment would mean a lot to us. This is the only hope we are counting on. Please be kind and generous enough to lend a helping hand. God bless everyone! Thank you Mid-day for supporting our appeal. With God’s grace and your wishes, six months have passed after the surgery and Mr. Joshi is recovering at a proper pace. Regular medical check-ups and pathological tests are being performed at intervals to monitor the efficiency level of the transplanted liver. Mr. Yash Joshi (Liver Donor) has also fully recovered. Thank you all again for your good wishes and help. Please do pray for everything to be alright. One month has passed after the surgery and both are doing good. Post care treatments will go on for more 6 months. Special thanks to all of you who have donated for this cause and still donating. Also a special thanks to Mid day again for such a wonderful gesture. 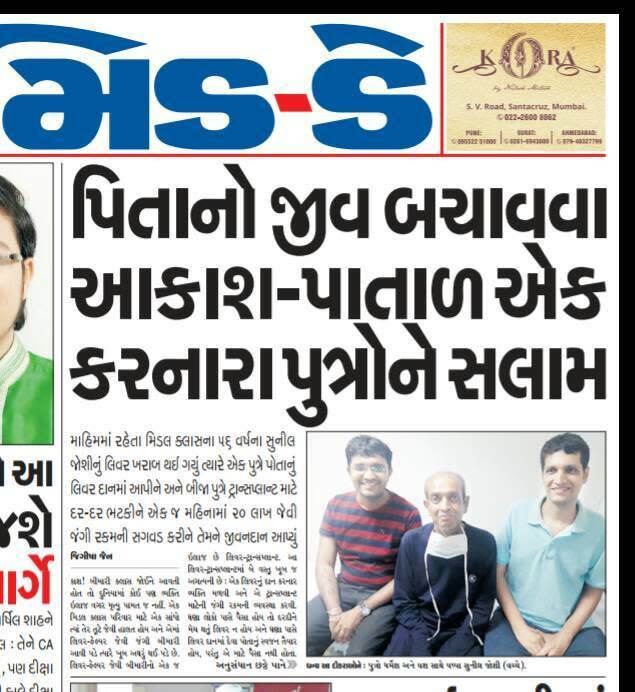 With God's grace, both Mr Sunil P. Joshi (Recipient) and Mr Yash S. Joshi (Donor) are doing well after the transplant. They both are discharged from the hospital and specific post-surgical care is being taken care at home. There is no way to fully express our gratitude for your loyalty. We tender our very big thanks for your generosity. Wish you a speedy recovery. May God bless you will long life to enjoy this world with your beautiful family.